There’s a great appetite for yoga amongst the mountain community for all the reasons mentioned above. Over time we have formed a lovely yoga community with a schedule of weekly classes around Bourg St Maurice and Les Arcs. I also teach private group sessions, workshops, events and yoga retreats. I love that we can do yoga outside with such powerful and engaging backdrops – the mountains make the best yoga studios. Summer or winter? Gah… Both!… I’m probably more a summery kind of girl but I’m going to say winter because winter in the mountains is un-missable. Where-as I can embrace all the qualities of summer wherever I am. 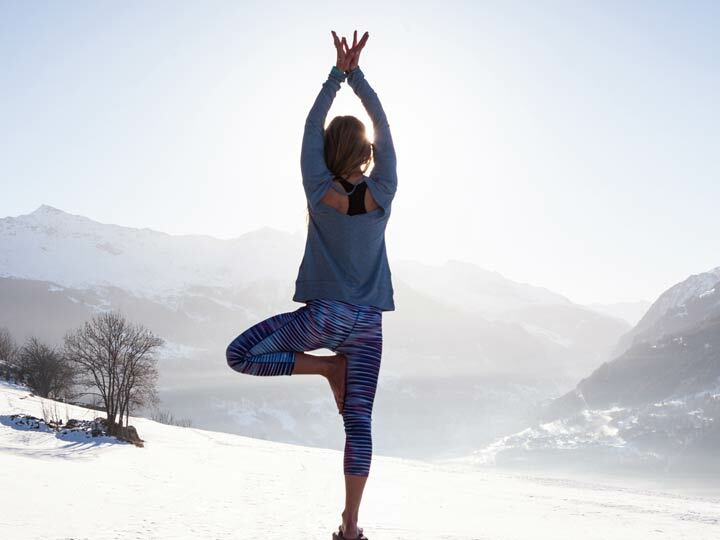 SNOWGA is a style of yoga that I’ve developed to compliment skiing, snowboarding and the mountain mindset in winter. The aim is to Move better, Feel better and Slide better by blending teaching points derived from my 3 main passions – Snowboarding, Yoga and Nature. It’s a dynamic yoga style that integrates movement with breath to create a feeling of flow – much like the flow we vibe with when riding the fall-line in our mountain sports.